(CNN) -- London prepared on Wednesday for what police warned could be "unprecedented" mass protests by anti-capitalist and climate change campaigners ahead of Thursday's G-20 economic summit. 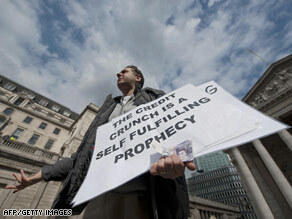 A protester addresses city workers outside the Bank of England in London on Tuesday. Metropolitan Police leaders were prepared to deploy a large number of officers to maintain public order. Authorities were especially bracing for possible violence around the Bank of England, which is expected to be the focus of protests on what's being dubbed "Financial Fools Day." Authorities investigated a suspicious package found Tuesday in the vicinity of The Bank of England. On Saturday, trade unions -- backed by 120 other groups, including environmentalists, church groups and political campaigners -- organized a peaceful march of thousands of people in the first protest ahead of the summit. Protesters called for jobs, fair distribution of wealth, and a low-carbon future. The G-20 summit brings together leaders and financial chiefs from the top 20 industrialized and emerging economies, along with leaders from non-G-20 nations. The G-20 countries represent 85 percent of the world's economic output. Also attending are hundreds of other officials, including the heads of the International Monetary Fund and the World Bank.